The Whittier Flotilla does its boating on Prince William Sound, however, most of its members live and meet in Anchorage, Alaska’s largest city. Whittier is 45 miles from Anchorage down the Seward Highway and is accessed by the 2.3 mile Anton Anderson Tunnel. This unique tunnel accommodates both train and vehicular traffic on the same one lane roadway by alternating directions every half hour for cars and then halting vehicle traffic when a train needs to go through. 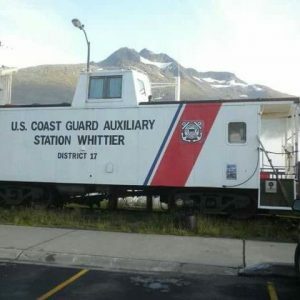 In the small town of Whittier on the western border of Prince William Sound, the Coast Guard Auxiliary occupies an old Alaska Railroad Caboose that has been converted by the members to function as a watchstander’s station.